LibraryThing for Libraries has added MetaMetrics’ The Lexile Framework® for Reading, commonly known as “Lexile measures,” to to its slate of enhancements. But rather than make it a paid enhancement, we’ve made it a free option for any library using any existing LTFL enhancements. High Plains has also leveraged the fact that the Lexile browser can be “launched” on its own, placing it on their general search page. As with other LibraryThing for Libraries enhancements, Lexiles works with virtually any library catalog (OPAC), and libraries have total control over the wording, placement and style of the enhancement within their catalog. 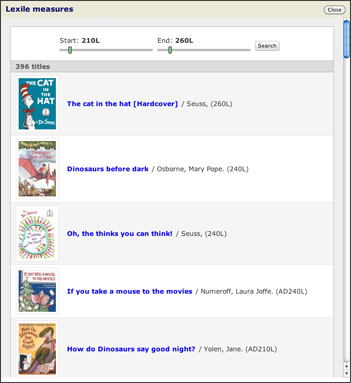 About LibraryThing for Libraries: LibraryThing for Libraries (LTFL) is a system of OPAC enhancements, designed to make your OPAC more engaging and informative. 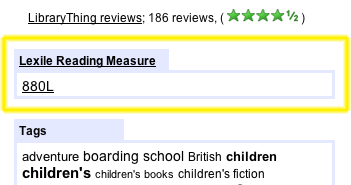 Lexile measures join the existing LibraryThing for Libraries enhancements: Tags, Reviews, Similar Books, Shelf Browse, Series, Awards and Other Editions. We also offer Library Anywhere, a cheap but full-featured mobile catalog for any OPAC. If you already subscribe to one of the LTFL enhancements, you can just turn on Lexile measures—for free—by adding the div tag to your OPAC’s bibliographic template page.